Also simply known as Binnion/Binneán. Dominates views of the Mourne Mountains from Annalong and Kilkeel. The folklore of Mourne explains the name Beanna Boirche as 'peaks of Boirche', a personal name. This character is said to have ruled his kingdom from Slieve Binnian. The name Binneán refers to the rocky tors which outcrop along the summit ridge. E. Estyn Evans, in his book Mourne Country, gives the name of one of these tors as The Buckie. In a discussion of the boats used at Kilkeel and other ports along the Co. Down coast, he explains the name as follows: Other variants of the lugger which old salts speak of, all of them of Scottish types, were the Fifie, Zulu, Banff and Buckie. 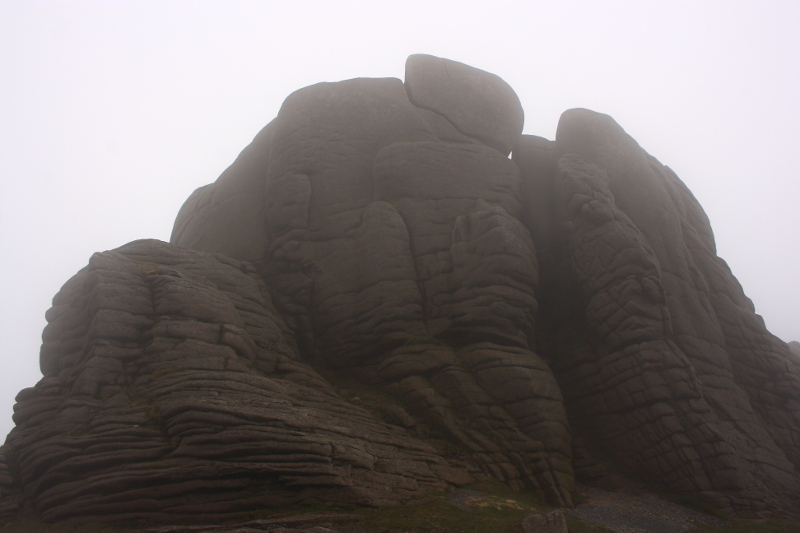 One of the lesser tors on the long spine of Slieve Binnian is known as the Buckie, a name which was meaningless to me until I saw it from the east against the sky and recognised a vessel in full sail [Estyn Evans, 159]. On the facing page is a sketch showing Slieve Binnian's backbone seen from the east including the Buckie. Slieve Binnian is the third highest mountain in the Mourne Mountains area and the 80th highest in Ireland. Slieve Binnian is the third highest point in county Down. Picture from Aidy : A glimpse through the cloud. Picture: A glimpse through the cloud.